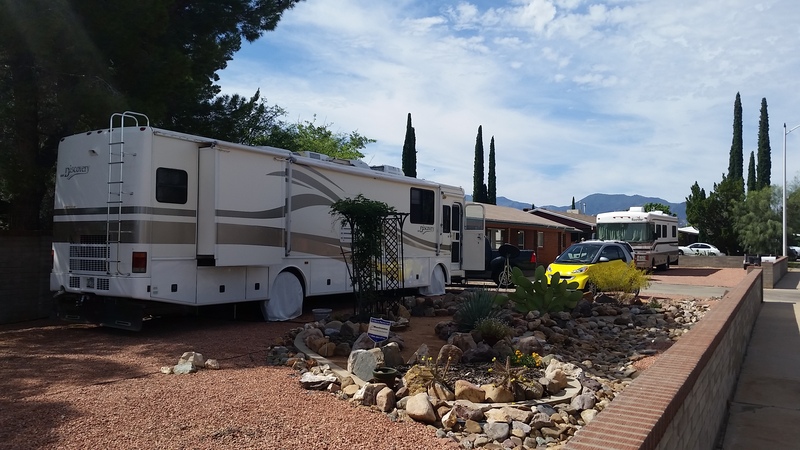 cinco de mayo will never be the same – RV Cheaper! May 5, 2017 May 6, 2017 RV Cheaper! How many times have you heard the saying, “do you remember what you were doing when…”? Alice and I went out to our favorite Mexican restaurant for Cinco de Mayo, we agreed to eat in the bar since they were busier than normal. A lady several stools down from us was quite chatty and soon began flirting with a guy who sat in between her and his date, yes he was with his date! Alice and I tried our best to carry on our own conversation but Ms Chatty was drowning out almost everyone’s conversation. Had the guy’s date only known before they sat down, she would have sat in between I’m sure. Despite that overpowering conversation, we still managed to have a pleasant evening. But from now on we will definitely eat in the dining room. Later we got home, I got on the computer and checked the latest on Facebook, read a few news articles and some of the blogs I follow. Alice got on to play a few of her online games, a typical Thursday night except that we ate out earlier. About 8:45pm Alice’s phone rang upstairs, I have no idea now why I went up there but as I entered the bedroom I could see on her face something horrible was going on. My first thought was Mom almost 91 is in the hospital. As Alice was talking I’m trying to let her focus on the call while trying to figure out what was going on. 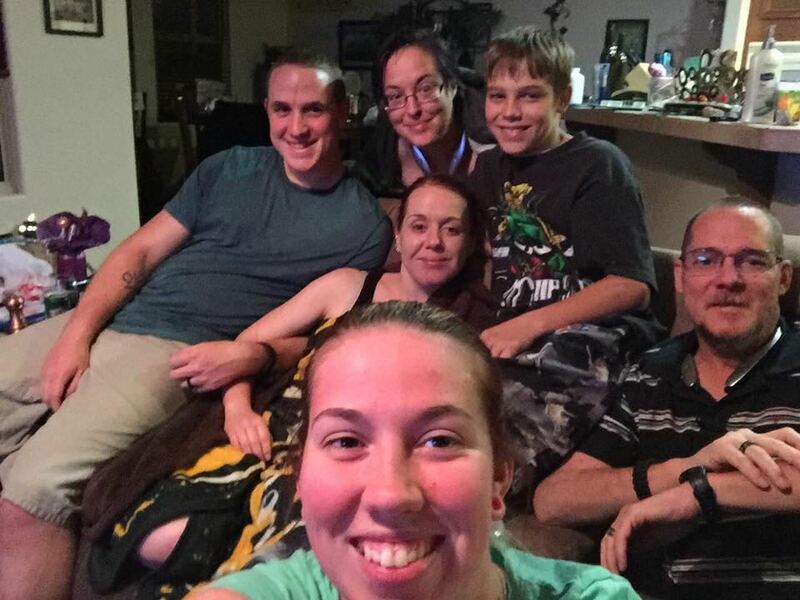 Once Alice gets off the phone she breaks into tears saying I’m so sorry, Jeff shot himself tonight and Megan says it doesn’t look like he’s going to make it through the night. I broke down, Alice & I cried for a while and then I collected myself enough to start making some calls. 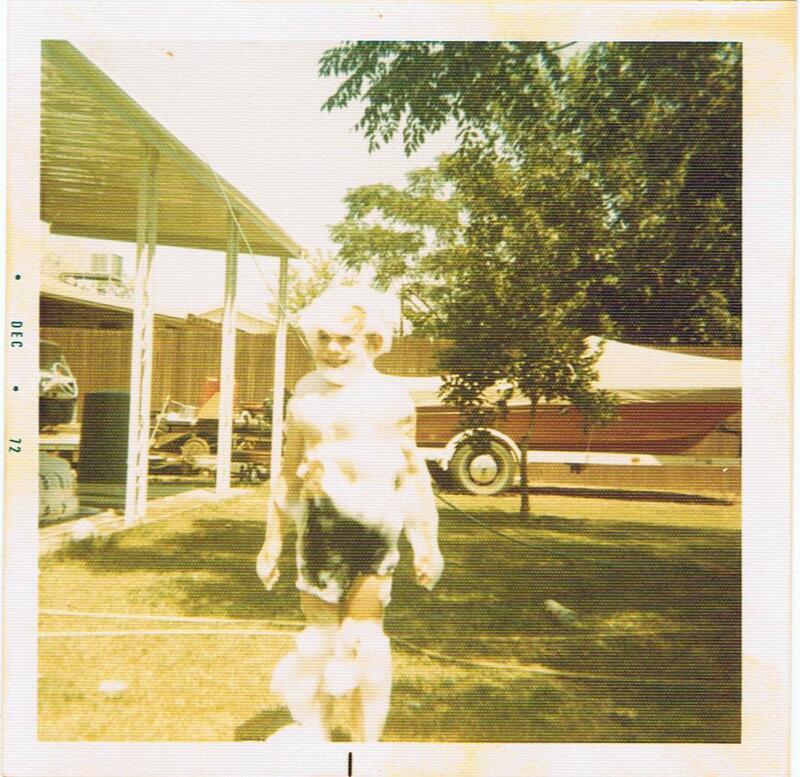 Since my oldest brother Dave passed just a few months back, I called his son Christian to call his mom and siblings. Next I called Mike and then to call our mother. 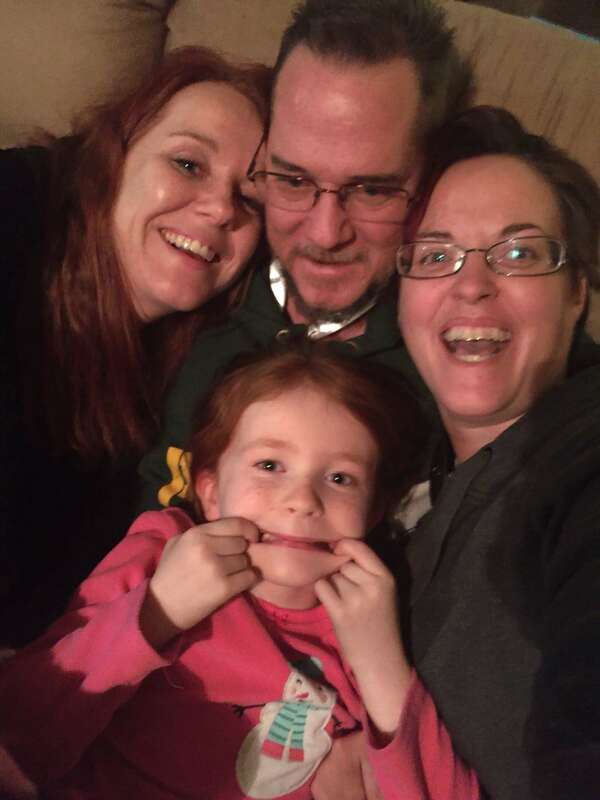 I don’t remember how long we all talked, all I remember is just moments after I got off the phone, Megan called again to say Jeff had passed. So that was our Cinco de Mayo last year. Dad and Dave were difficult losses but Jeff’s has been a totally different path for us. This story was difficult to share, but I desperately want to share that if you think things are reaching a crisis point with someone you know, you’re probably right. We are all only human, we all have our weaknesses. Throw in any kind of addiction and there’s no way to kick it alone, we all need help at some point or another. No one can tackle depression, PTSD, alcohol or substance abuse alone. Three weeks before, Jeff scared me bad, it took an hour to collect myself so I could call and even talk coherently to him. He did a great job of convincing me all was good. I should have called the Suicide Hotline number… 1-800-273-8255, with their training they probably could have reached him the right way, I wish I had called. I wish Jeff’s kids and grand kids had him with then, even if he never got over being mad at me for calling for help. 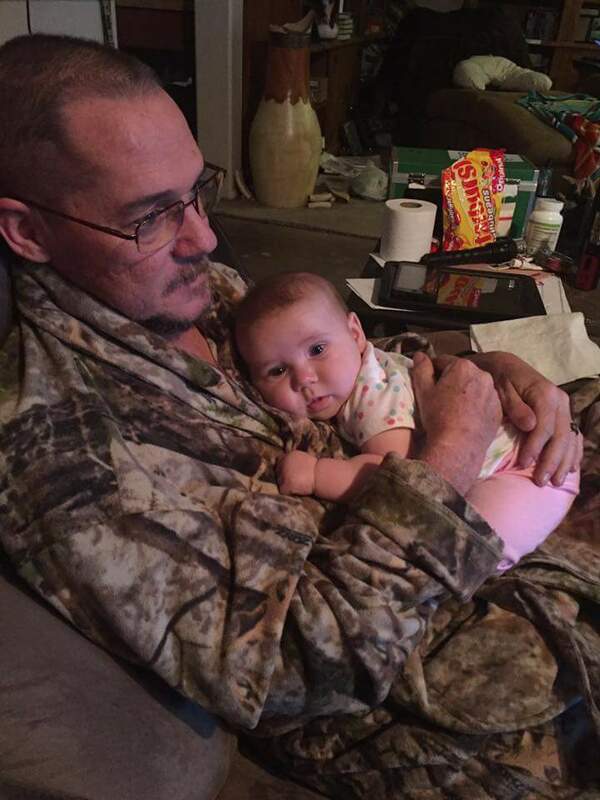 Jeff with his daughter, grand daughter and Megan. When Dave passed, we had a celebration of life and us three brothers all said that’s what we wanted to happen after we passed. Megan’s mother Beth and step dad Tony told us to bring down our RV and park in their yard since they planned to host Jeff’s celebration of life. That allowed us to help with cooking and prep for the celebration of life while Beth and Megan dealt with funeral arrangements. My Brother Mike flew in, picked up Mom from Payson and came down to Sierra Vista for the celebration as well. The day of the celebration Beth and I went to the funeral home to pick up Jeff’s ashes. It was unreal that I was carrying Jeff now, something I had not done since he was an infant. I think I creeped out Beth saying it but it just came over me that way. One of the times I was babysitting Jeff, he wanted to swim and was thrilled I filled the pool with bubbles. When Dad passed in 2011, I got Mom and myself jewelry urns for his ashes. I hung mine on the truck mirror to make sure I thought about him every time I was driving somewhere. I added another when Dave passed in 2015, now I have one for Jeff. Mike & Michelle had been working at the Lighthouse Museum at Port Orford so we each bought dog tags for Dad, Dave & Jeff since they were the only three to serve in the military. Alice wanted them with my urns so they wouldn’t be mixed up later 😉 Seeing these daily has helped me get past the sadness much sooner. I found talking out loud to them makes it feel like they are right there with me when I need it. On bad days I chew them out for leaving us too soon. 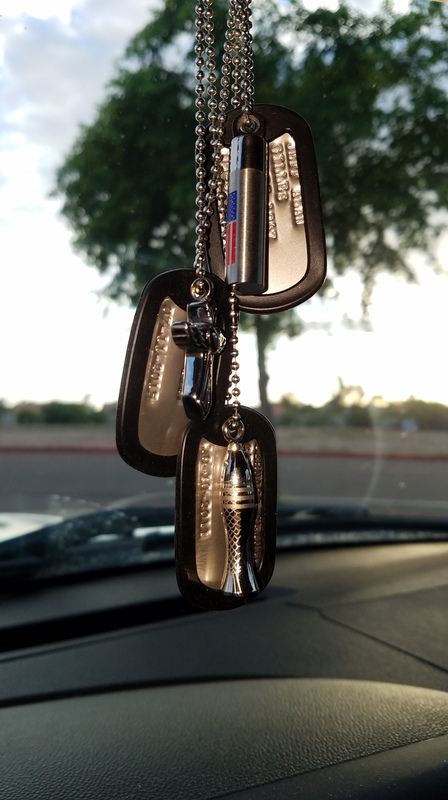 The jewelry urns with the dog tags, having those three with me has been a big help. 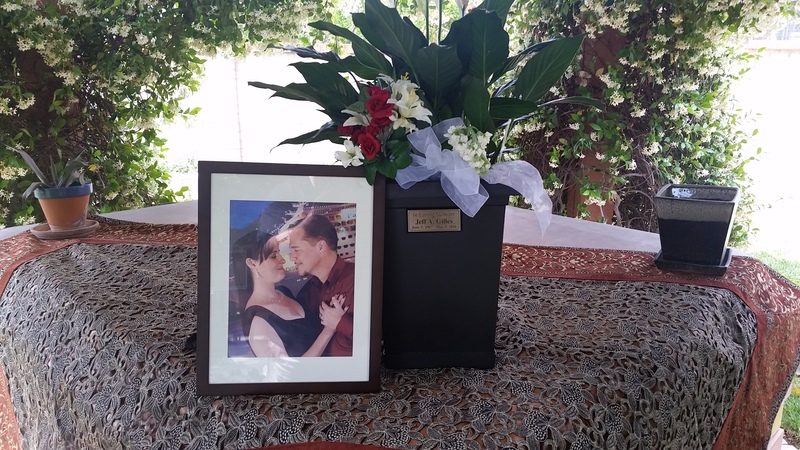 Jeff was an organ donor and his passing helped several people. 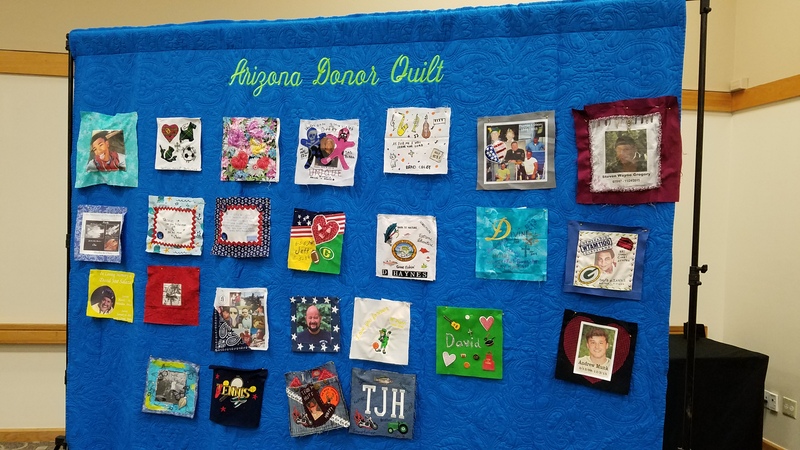 In March (2017) the Arizona Donor Network had a memorial quilt pinning ceremony that Jeff’s mother in-law Beth told us about. 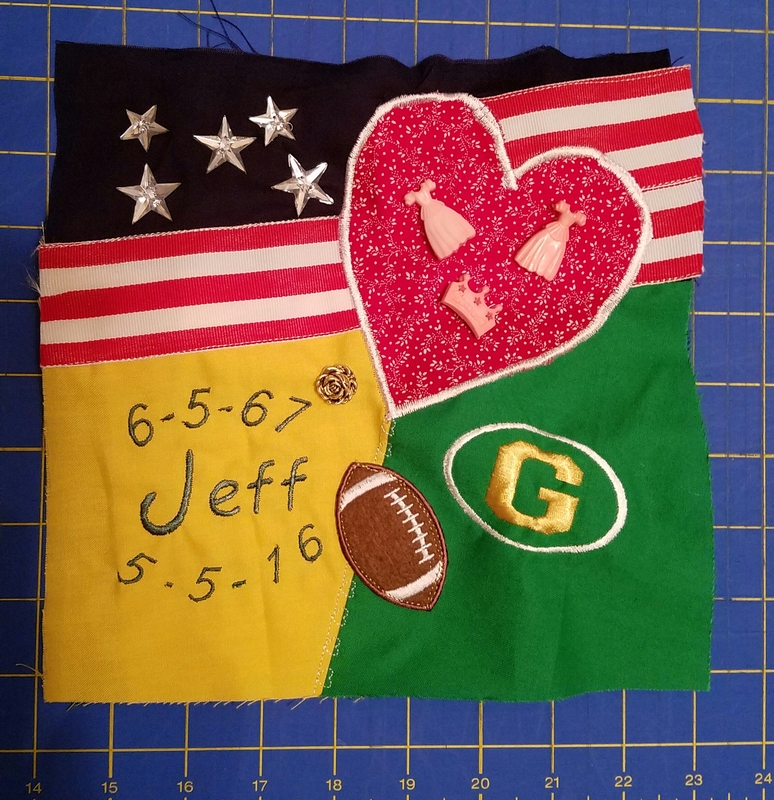 Alice made an quilt block that I think captured Jeff’s life with Megan, the Kids, Grandkids, Packers and the flag representing his military service both active duty and as a contractor with four tours in Iraq and Afghanistan. I didn’t expect the quilt ceremony to be such an emotional event, but I’m glad there’s another memory of Jeff floating around. Hopefully we will get to see the quilt on display soon after it’s sewn up and traveling around the state. There’s no way I’d remember that insignificant, chatty conversation at the end of the bar during Cinco de Mayo 2016, if it wasn’t for the parallel events that unfolded that night. Those unrelated memories are all mashed together with the night Jeff passed, much like the days Dave, Dad and my father in-law passed, 9/11, the Challenger disaster or when Kennedy was assassinated. All of the firsts have come and gone as of tonight and those are always the toughest. I’m thinking Jeff’s 50th birthday next month is going to be the next mental hurdle. Thanks to some great neighbors, I did find out tonight that I will be able to enjoy Cinco de Mayo while remembering my little brother. Previous grilling and smoking oh yeah! Next wash those windows good now, ya hear? My sincerest condolences. May he rest in peace. Hope you find comfort surrounded by loving family. Bernard, Very touching. I hope if helped you some to put it in words. It is so hard when anniversaries of the sad times in our lives happen. But I am confident that you know that the good memories out weight the bad. Wow Brother, I’m so glad you can put all that you wrote together in such a great way. We all think and deal with it the best we can. I have to see and stay busy with the things I like but only delays the confusion and denials of it all. Your words are a big help! I sure wish and hope he can see what you wrote, then he would know how much we all really feel! I agree with you on life’s major happenings, they are burnt into the mind exactly where you were what you were doing. I guess that’s good and bad but one never forgets.